A decade ago, U.S. politics was a technological hinterland, exemplified by Ted Stevens, the head of the Senate Committee on Commerce, referring to the Internet as “series of tubes” that could somehow get jammed up. Today that has clearly changed. Politicians and the groups affiliated with them use the full spectrum of digital tools available—from websites and social media accounts to sophisticated databases and analytics suites. When the midterm election predictions started looking grim for Democrats earlier this year, someone in the party must have decided to go all-in with email messaging. The outreach started with a few extra emails to subscribers each week and grew into a fevered pitch of seemingly never-ending solicitations. The emails were clearly part of a conscious strategy to fight tooth-and-nail to retain control of the Senate this year. The problem, of course, is that while it may lead to a short-term boost in donations, long-term it is a terrible strategy. This sort of extremely aggressive messaging—sometimes two or three times a day—is certain to lead to significant unsubscribes, as well as general antipathy. After the last presidential election, the Republicans were seen as being the less tech-savvy party. 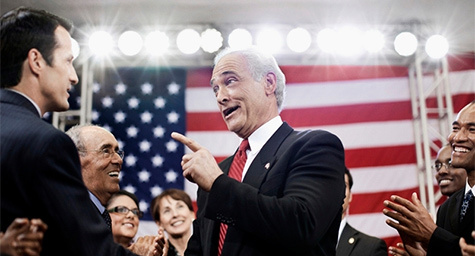 In 2012, while the Obama camp was making the most of Big Data, Mitt Romney’s get-out-the-vote system couldn’t even function when he needed it most. The Grand Old Party has recovered well since then. It has closed the technology gap by focusing on both big projects and small tweaks. 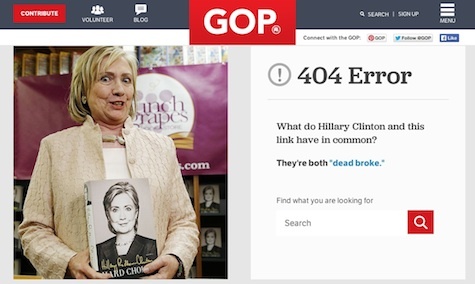 One of the latter is the 404 error page for GOP.com, which cleverly takes a swipe at Hillary Clinton’s “dead broke” comment earlier this year. The small move paid off well, garnering laughs from the faithful and plenty of good press. The lesson? Every page on your website matters. Also, a second lesson: Sometimes just have fun. The Republicans may have gotten the better of Hillary with their 404 page, but she’s shown that she’s plenty digital-savvy as well. Case in point: Hilary’s social media pages, especially her Twitter profile. 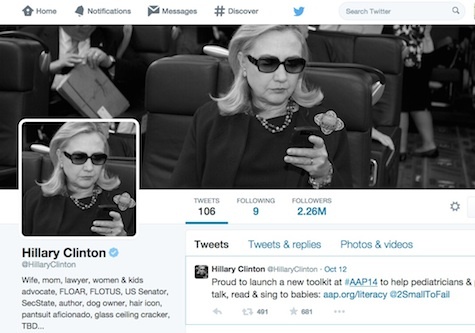 Rather than use a standard politician headshot (like Bill does), she cleverly references the Texts From Hillary meme with her profile photo and header. Moreover, she makes a winking reference to her future presidential plans/non-plans in the description (“…pantsuit aficionado, glass ceiling cracker, TBD.”). Overall, it’s a smart use of profile page elements that many people (and brands) often write off as being unimportant. Representative John Dingell was born in 1925, yet has somehow mastered social media better than many Millennials. How? He (or someone on his staff) found a wonderful middle ground between ignoring social networks and trying to look more hip than would be natural. Dingell tweets regularly about a mix of topics (politics, sports, technology, etc. ), almost always with a dry, self-deprecating tone. His self-swipes about his age and looks are often brilliantly mixed with pop-culture references—which is one of the reasons BuzzFeed labeled him as “probably the best person on Twitter. Finally, some stats and insights from a recent report about voters’ media consumption habits. The research—from Google, Targeted Digital (a Republican digital consulting firm), and Well & Lighthouse (a Democrat digital consulting firm)—found that less than half of likely voters say live television is their primary way of viewing video content, yet the vast majority of political video budgets go toward traditional television ads. Basically, there’s a huge gap between where spends are going and where consumers are actually spending their time. Those, of course, are important words for not just campaigns, but for all of us. Discover digital marketing tactics that will accelerate demand and boost sales. Contact MDG Advertising today at 561-338-7797 or visit mdgadvertising.com. MDG Advertising, a full-service advertising agency with offices in Boca Raton and New York, NY, is one of Florida’s top branding firms. MDG’s capabilities include print advertising, direct mail marketing, branding, logo design, creative, digital marketing, media buying and planning, radio and TV advertising, Web design and development, online video advertising, infographic development, email marketing, mobile marketing, content marketing, social media marketing, and SEO. To learn about the latest trends in advertising and branding, contact MDG Advertisingtoday at 561-338-7797 or visit mdgadvertising.com.